Define the innate immune system and its role in protection against pathogens. Be able to list the structures, secretions, and microorganisms (yes microorganisms) involved in innate immunity. Host defenses can be divided into two categories, innate and adaptive immunity. Innate immunity involves general mechanisms in a healthy animal that prevent colonization by microorganisms and antagonize or kill those that do enter the host. They are always present and the strength of their response does not increase with repeated exposure to the inducing microbe. Adaptive immunity develops through the mechanisms that are turned on in response to a pathogen. This involves activation of the immune system, where the initial response to a pathogen is weak but becomes quite vigorous over a period of a few days. Adaptive defenses also have a memory of encountered pathogens such that a second infection by a pathogen is met with a more rapid and vigorous immune response. The rest of this chapter will cover innate immunity. The second chapter will describe adaptive immunity, summarize with a description of the entire immune systems response to a pathogen, and then finish by presenting errors the immune system makes and how those affect the body. Innate immunity is the first line of defense against a pathogen. The system must be somehow circumvented by the pathogen before it can enter into the host. In most cases, the adaptive immune system is only activated after the innate immune system has been breached. Here we examine various structures, products and cells of the innate response as shown in Table 15.2. Microbial antagonism The normal flora of the body prevent pathogens from colonizing and causing disease. Complement proteins These proteins can be triggered by microbial secretions or by antibodies. They alert the immune system and can cause cell lysis. Inflammation A reaction to tissue damage that involves a large collection of cells, proteins and chemicals. Phagocytes Cells that attack microorganisms, engulf them and kill them. They are a major defense of the body. Natural killer cells Cells that roam the body and attack cells coated in IgG. Parts of the immune system that are always present and whose reaction against a pathogen does not increase with exposure to it. Natural killer cell activation does depend on antibodies, but they are not inducible. Therefore we include them here. Figure 15.6 summarizes the various anatomical defenses of the body. The skin is an extremely effective barrier to microorganisms. Besides preventing the cells of our body from escaping, it also prevents microorganisms from getting in. Skin contains several layers of tightly packed, heavily keratinized cells (keratin is a fibrous protein that gives skin, hair and nails its toughness). It is very difficult for most organisms to squeeze in between skin cells. Skin cells are also continually being shed and replaced by new ones, thus removing any microorganisms attached to them. The skin surface is also very hydrophobic and dry, which prevents the growth of many microorganisms. Sebaceous glands are present throughout the skin and they secrete hydrophobic oils that further repel water and microorganisms. The oil also helps keep the skin supple and flexible, preventing cracking that might allow microbial access to internal layers. Finally, melanin in the skin also helps to reduce the harmful impact of UV light by absorbing it. UV light can be damaging to all cells, including cells of the immune system. Figure 15.6. Anatomical immunity. Parts of the body are designed to prevent the passage of unwanted microorganisms. Some examples of structures that inhibit the advance of pathogens include the skin, hair, blinking eyelids, nose hairs, cilia in the lungs and the peristaltic action of the digestive track. Hair helps to restrict access of airborne pathogens to the skin. It protects the most sensitive or exposed body orifices, including the nasal cavity, the eyes and ears. Hair also serves as a cushion lessening the severity of cuts and grazes, which decreases the depth and number of breaks in the skin. The movement of various body parts can help to rid the body of microorganisms trying to colonize. Blinking the eyelids constantly sweeps microorganisms out of the eye. The entire respiratory tract, except bronchioles and alveoli, contains a mucociliary escalator consisting of mucus producing goblet cells and ciliated epithelium. The cilia continually beat upward and any particles that get stuck in the mucus are pushed out of the lungss. The peristaltic action of the gut not only moves food along our digestive tract, but also flushes microbes out of our system. If microorganisms do not have a method of attachment, they rapidly leave the gastrointestinal tract. The constant flushing of the urethra by urine helps to keep the bladder free of bacteria. 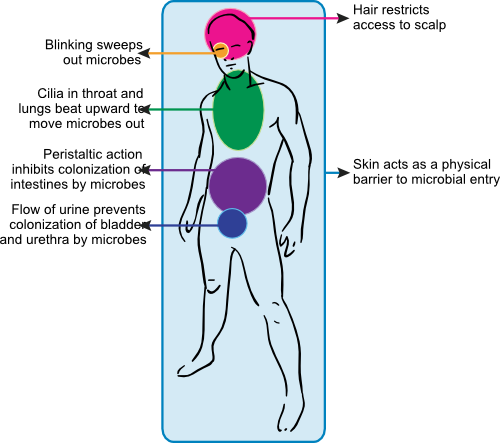 All of the above movements continually remove microbes from our bodies. The body also produces a number of antimicrobial substances that inhibit or kill microorganisms. Collectively these substances are known as tissue bactericides. Tear ducts, sebaceous glands, ears, nose, lungs, mouth and digestive tract all secrete antimicrobial substances. Table 15.3 lists some of the common tissue bactericides, their mode of action and location. The human body produces a large number of antimicrobial chemicals and proteins to keep microorganisms in check. One important group of broad-spectrum antimicrobial peptides is the defensins, which participate in the host defense of mammals, birds, plants and insects. Their presence in a wide variety of species probably indicates that they are an ancient form of antimicrobial antagonism. Defensins form a family of cysteine-rich, cationic and structured polypeptides of 29-42 amino acids that contain three or four disulfide bridges. They work by disrupting the membrane of a wide variety of pathogens, including gram-negative and gram-positive bacteria, fungi and some enveloped viruses. They also serve as chemokines, which attract elements of the adaptive immune system. Defensins are expressed by many different tissues and it is now clear that they are a vital part of innate immunity. As mentioned in Chapter 14, the normal non-pathogenic microorganisms that live inside and on our bodies as part of normal flora have an important role in defending us against pathogens. This is accomplished in three ways. The normal flora are well adapted to the tissues they live on and they out-compete pathogenic microbes for these sites of colonization, thus preventing harmful bacteria from gaining an initial foothold on our bodies. The normal flora produce specific antimicrobial compounds (called bacteriocins) that kill or inhibit closely related species. The normal flora also produce non-specific compounds such as the end products of their metabolism that may inhibit pathogenic bacteria. They utilize nutrients, limiting their availability to pathogens. Complement is an enzymatic system in the blood containing over 20 proteins (some of the more prevalents proteins have been given the names C1-C9) . These proteins are produced in a variety of cells, including macrophages, hepatocytes (located in the liver) and epithelial cells in the gastrointestinal mucosa. They then circulate in the bloodstream until activated. Figure 15.7 shows a conceptualization of the complement cascade. Figure 15.7. The complement cascade. The reactions of the proteins of the complement cascade. See text for details. Activation of the complement system can follow one of three pathways: the classic pathway, the lectin pathway and the alternative pathway. The classic pathway begins when antibody of type IgG or IgM reacts with antigen (antibody structure is described below). IgG and IgM contain a masked C1 binding site that is exposed upon binding to antigen. C1q binds to this site and begins the complement cascade as shown in Animation 15.1. Binding of C1q activates C1r that in turn activates C1s. This forms an activated C1qrs enzyme that catalyzes the cleavage of C4 into C4a and C4b. Active C1qrs also degrades C2 into C2a and C2b. This is an enzymatic reaction, in which the binding of C1 to antibody results in the digestion of a large number C2 and C4 proteins. C2b and C4a are released into the environment. C2a and C4b bind to the membrane and associate to make a C3 convertase that acts on a large number of C3 proteins making C3a and C3b. C3b then combines with C4b and C2a to form a C5 convertase, cleaving C5 to C5a and C5b. The end result is the active degradation of a large number of complements proteins, by this expanding cascade. In this way a single antibody-antigen reaction can be amplified and produce an aggressive host response. Complement activation leads to several ultimate results. The C3a and C5a produced serve as a chemoattractants for phagocytes. C3a and C5a also bind to specific receptors on mast cells inducing degranulation and the release of inflammatory substances. C3b remains bound to the Fc portion of the antibody or may bind to the cellular membrane of the trigger. In either case, it serves as a protein that phagocytes can bind to and then envelop and kill the bacteria. Several of the complement proteins (e.g., C5b, C6, C7, C8 and C9) form a pore in the membrane of the initiating microbe that causes leakage of cell contents and results in cell death. When inserted in membranes, C8 and C9 form a phospholipase that can destroy membranes of the pathogen. This can inactivate a virus and remove the outer membrane of gram-negative bacteria, making their peptidoglycan accessible to lysozyme. The lectin pathway is very similar to the classical pathway except the trigger is different. The host will produce a protein called mannose-binding lectin (MBL) that can attach to polysaccharides that contain the sugar mannose. It turns out that a significant number of microbes produce mannose containing polysaccharides on their surface, and MBL will associate with them. When it does, two other proteins (MBL-associated serine protease 1: MASP-1) and MASP-2 binds to MBL forming a structure similar to activated C1qrs and precipitate the complement cascade by cleaving C2 and C4. From here the reactions are similar to the classic pathway. The alternative pathway of complement activation does not involve antigen binding to antibody. This pathway involves interaction of the C3 compliment protein with the cell surface of a pathogen. C3 in the blood spontaneously hydrolyzes a thioester bond at a slow rate to form C3(H2 O). This change in shape allows the binding of plasma protein Factor B, which is then a target for Factor D to cleave Factor B into Ba and Bb. Bb remains part of the C3(H2 O) complex, now called C3(H2 O)Bb. This complex, also known as a fluid-phase C3 convertase, will cleave a C3 molecule and cause C3b to interact with a pathogens membrane surface. If no pathogen present, the C3a and C3b proteins will rejoin, ending the reaction. If bound to a pathogen, further activation of this membrane bound C3b molecule by Factor B and Factor D results in the formation of a membrane-bound C3 convertase. This convertase with activated Factor B and D is unstable, but can be become stable by the binding of properdin. Properidin is another blood protein. Once active and stable, C3 convertase digests C5, forming C5a and C5b. Subsequent steps in the alternative pathway are similar to the classical pathway. The alternate pathway allows antibody-independent activation of the complement system, which is important in initial defenses against a new pathogen before antibodies have been synthesized. Individuals who are deficient in complement formation have compromised immune systems. For example, complement deficiency in C3, C5, C6, C7, C8 or C9 leaves the person more susceptible to dangerous bacterial infections. The innate immune system is always present and cannot be induced by exposure to pathogens. Innate immunity consists of anatomical structures, antimicrobial secretions, the normal flora, complement, the inflammation response and phagocytes. Complement is activated by antibodies or certain microbial secretion and causes a cascade of enzymatic reactions. The results of these reactions is induction of inflammation, recruitment of phagocytes and the formation of a pore in the membrane of the microbial cell. 4. Defensins act by disrupting bacterial membranes. Do you see this as a potential problem for host cells? 5. Which of the following is not a result of the complement cascade?